This is an amazing and newly-arrived, altar-sized quartz from Barros do Selina, Brazil weighing 9.8 oz and measuring 4.7” by 2.7” by 1.6”. She is a very light smoky quartz with well-healed base and contact area then topped with rich, deep honey gold elestial quartz creating a series of scepter-like terminations! The top is more honeyed with amazing glyphs that look like the sands in river deltas. 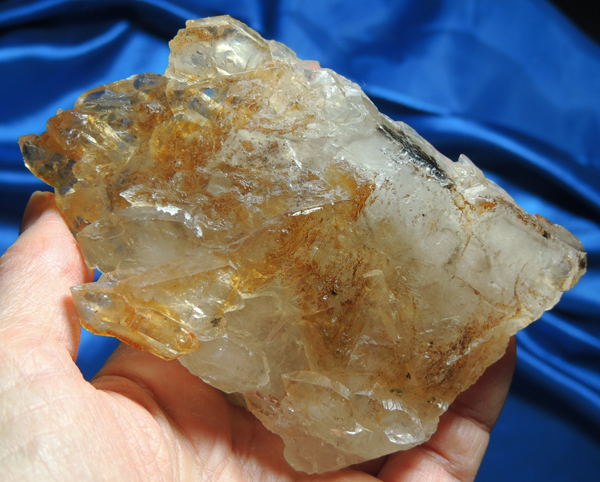 The back, edged with albite, clearly shows the original quartz point with the overlay – truly a kind of scepter. When you show an ultraviolet light on her, she glows hot pink with gold edges! This type of fluorescence is uncommon in quartz! At first, I could see no tourmaline, but I did find an area of marvelous dendrites! With a loupe, I continued the search for tourmaline and found a single rod of gorgeous pink rubellite tourmaline although the color was hard to capture with a camera. She is most definitely a heart crystal even with only the a bit of tourmaline! She is in excellent condition and will be a meditation favorite when she isn’t residing on your special love altar! Like the fluorescent quartz without the rubellite, I was astounded as wave after wave of joy, love, compassion, empathy and sheer ebullience washed over me. But with her, it was even more intense … almost like a total heart cleansing that left my heart pure, open and joyful! Through the years, we “toughen up” our heart because of disappointment, relationships that have gone wrong, a dysfunctional family and more. So we shut down the very thing that opens our lives to joy and love and then wonder why true love continues to elude us! This is a crystal that teaches the true meaning of love in all its purity as it has always existed and always will exist. She is an Old Soul that has taught this message for eons and it is one that today’s Light Worker needs more than anything else as it will open them up and enhance their personal healing as well as healing of others. Her rubellite adds precious gentleness and balance to the heart energies while her smoky aspect adds protection to the fully-open heart. She is most definitely a Spirit perfect for healing the heart on all levels!